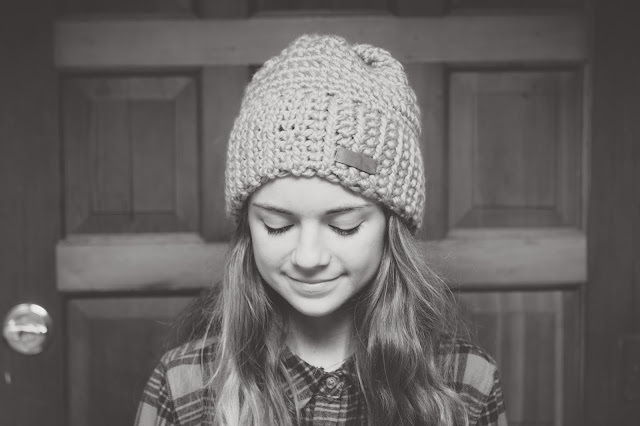 The beanie. I love them and I always reach for one when I get dressed. I love this mustard color and I usually have to talk myself out of wearing it every single day. 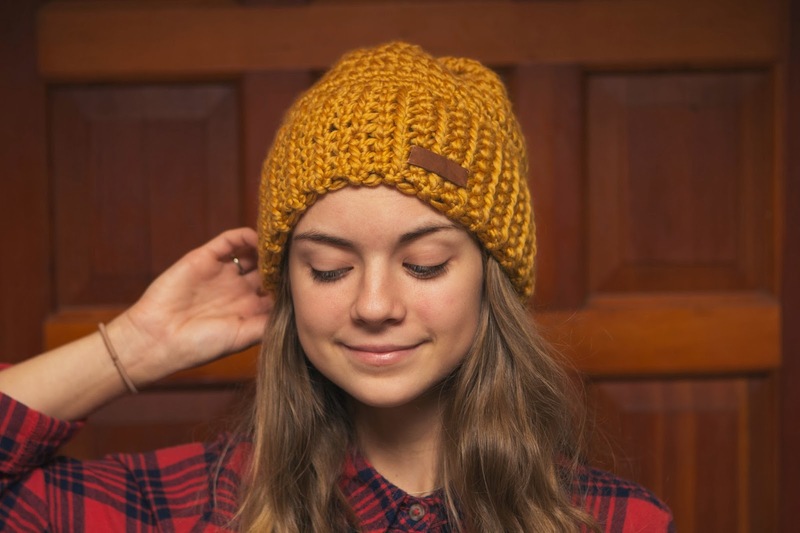 Earlier this week I introduced instructional videos for crocheting, today I am sharing the pattern to this hat so you can put those videos to use! sc in each stitch, only the front of the stitches to make a rib stitch. continue until reaches 22-24 inches (depending on size of head). Try it on around your head and make sure it fits snuggly. It should look like a headband right now. Sl st the ends together to make a "headband." From top of where you just finished slip stitching your ends together, 2 dc in each stitch around hat. 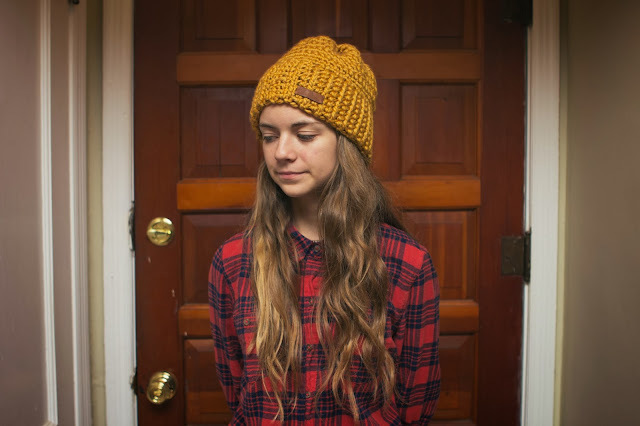 Once you come back to the beginning, continue around your hat with a dc stitch, but only once in each stitch. this will keep the shape as a rectangle instead of growing bigger and bigger. Continue until hat measures a 10 inch rectangle (or keep going if you want it to be slouchier). Tie off ends and lay hat flat (see below photo). From the middle, draw a loop on to a middle stitch and slip stitch through both layers of hat. Take the middle of another layer of the hat and keep slip stitching layers together until there are no large openings on the top of your hat. Tie it off and you are finished! Optional: Add a yarn pom pom on top and a little scrap leather rectangle! *This pattern is for personal use only. I have been adding leather to all my crochet and knitting projects these days. I love the added detail, I think it adds so much! I would love nothing more than to see your crochet projects you are working on, so please show me if you decide to make anything! I am totally in love with this pattern and this hat! Thank you so much for sharing! I love this! If you don't mind me asking, what kind of yarn did you use? I used Loops & Threads Cozy Wool Yarn! I was bad at knitting I am almost afraid to try crochet. It the difficulty level roughly the same? I love this toque pattern ! 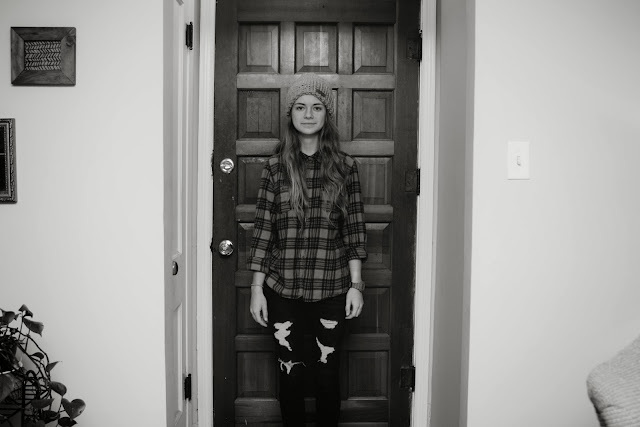 I think everyone is different. My room mate loves knitting more than crocheting and said she couldn't figure out crocheting. I personally think crocheting is easier to make into any shape you want! You should give it a try, I think it is much easier than knitting. So darling!! I could never make it look that good! Hello! 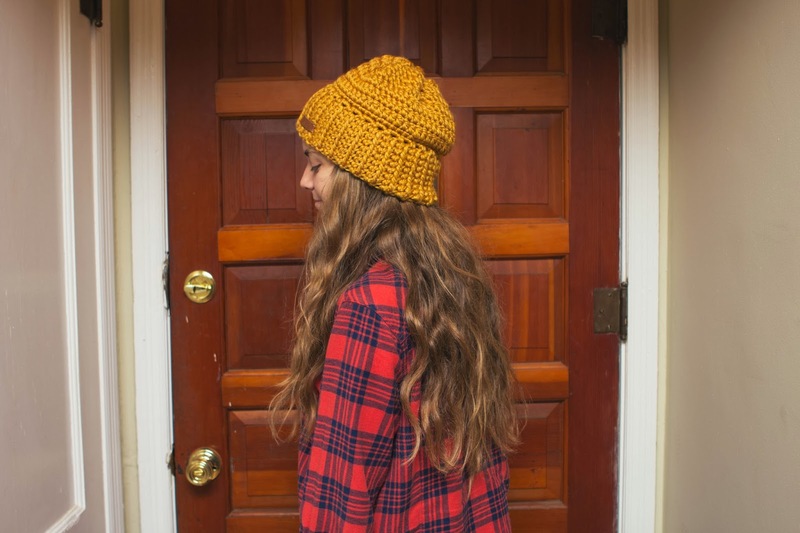 I have been searching for months for a good beanie pattern! Thanks! I'm a little confused with the ending of this... do you think you could post a video of how to finish it? I'm sorry about the confusion! I added some photos above..hopefully it helps. I'm trying to get a video in the works for clearer instructions! Hey I was wondering what size yarn it was? Thank you :) Just so when i make it It can --hopefully-- look something like this. Hi! This is Super Bulky size 6 yarn. It is a 4.5 oz skein/90 yds. How do you get the rectangle to be so flat? My portion with the double stitches is really wavy, like there's too many stitches. I think that when you start the dc rows only the first row is two dc in every stitch, just so it fills out the row, all subsequent dc rows are crocheted as normal. Otherwise you'd double your number of dc every row, i.e. 50, 100, 200, 400 etc. increasing each dc row. For the top, think of it like you have to sew up all the big holes. 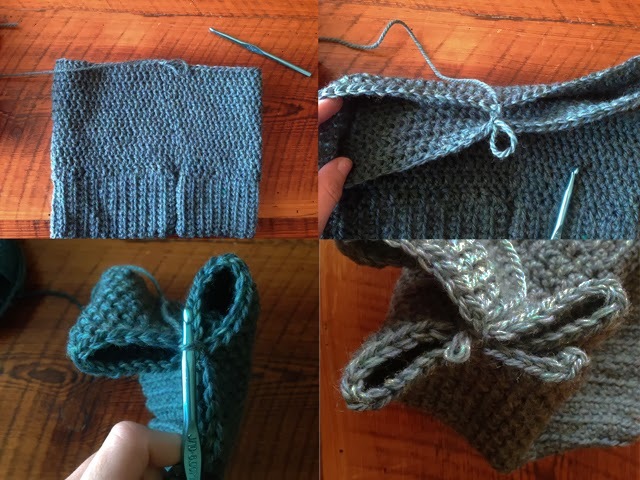 So once you have your rectangle, lay it flat and slip stitch through the top and bottom layer that is laid flat. This will join it in the middle. Continue to keep folding your hat and slip stitching through the layers so that the "holes" are getting smaller and smaller. E-mail me at always.rooney@gmail.com if you are needing further instructions! Is there anyway you could make a video of how your close the top of the beanie? I'm having a really hard time visualizing what to do. Great Pattern! How are you adding the leather? Are you simply stitching it in (via Crochet stitches)? Love the pattern and love the leather piece you add. Where do you get that at? I found this in Pinterest, as I was looking for the perfect boyfriend hat for my guy AND myself this fall. And this is it! I can't wait to make myself a version in every colour, and a few for him too (he has a hard time find hats he likes that also fit his head). Thanks so much for your clear directions and beautiful photos! Great pattern can't wait to try it ! Hi there! 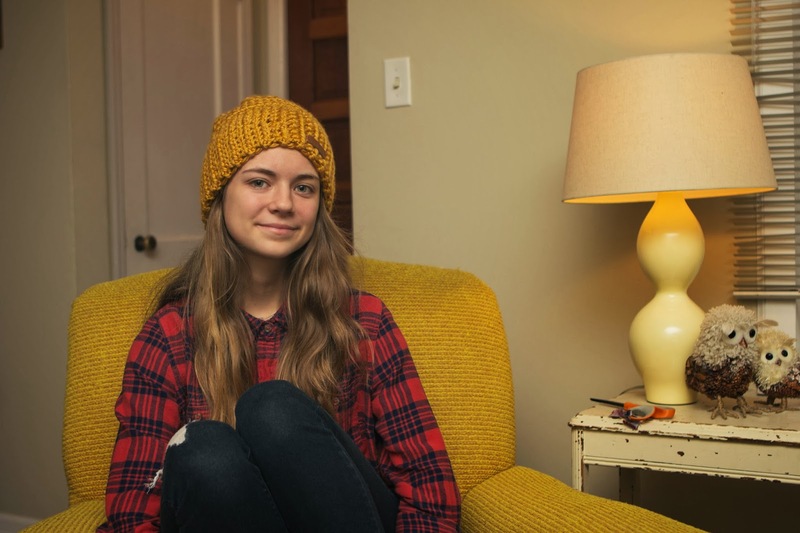 I am trying to make this beanie but after finishing the headband part (which looked good) and as I am working upwards, its looking more like a flower than a rectangle. If I lay it flat, it is in the shape of a rainbow. Do you know what I am doing wrong here? I am using a J hook and bulky 6 yarn. Thanks! I think you are adding an extra stitch each round, so it isn't laying flat. I would suggest making sure you are making the exact same number of stitches all the way around! This hat is SO my type of beanie. I love it :) what size yarn did you use?? Hi Courtney! 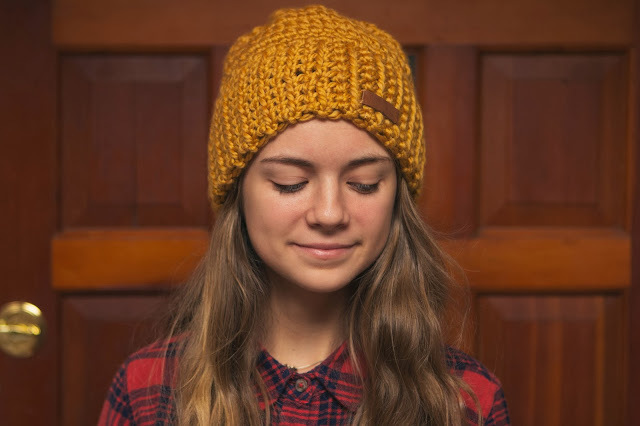 I'm selling crocheted products to help fund for a mission trip in the summer, and I wanted to ask your permission to sell beanies made with your pattern (giving you credit, of course). Thanks! Hey Jaime! Thanks so much for asking permission, you can definitely use it!